I wanted to interview Brett Thurber for a number of reasons. 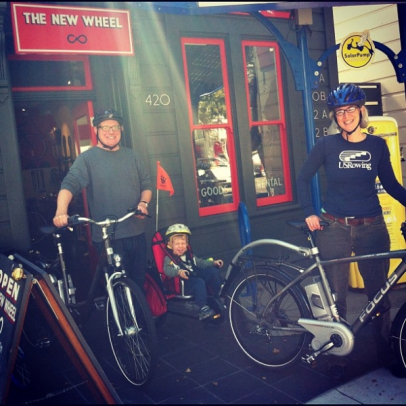 I remember the buzz in San Francisco’s cycling community when this shop opened exclusively for electric bikes. 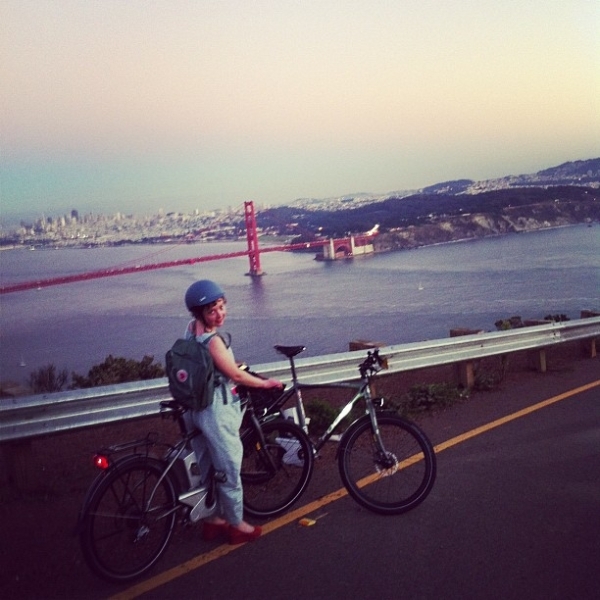 Despite seeming like a practical choice for SF’s massive hills, cyclists had a bias towards e-bikes. Why? 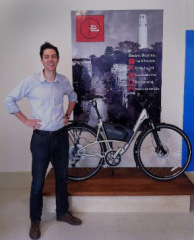 My interest was also perked by Brett’s guest post of the Grace One where Brett explains his preference for a bike with pedal assist over a throttle. Brett says electric bikes are revolutionizing the transportation system, but I think The New Wheel is revolutionizing the electric bike scene with hip branding, an elegant shop ambiance, and an insightful owner. Let’s take a step back from the technicalities and ask Brett about some basics. When, where and what was the first electric bicycle you rode? I got excited about the idea of electric bikes first, before having tried one. Later I went out and tried to find a bike that matched my expectations, which didn’t work out so well at first. It wasn’t until I tried a Trek Ride+ bike with Bionx that I felt I had found a bike that matched or exceeded my expectations. What bicycles do you currently have in your fleet, electrical and otherwise? We stock bikes by Kalkhoff, Focus, BH Emotion, OHM Cycles, and then Bionx retrofit kits. All of our bikes either are built around the Bionx motor system or the Panasonic motor system. What do you love about E-bikes? Truly revolutionary transportation has a way of changing our perspective on life: we understand ourselves, our potential, and society differently by the way we get around. The electric bike is a perspective changing technology. I think riding a quality electric bike for the first time, and understanding the potential inherent in the bike between your legs, is akin to what it must have felt like to ride a train for the first time in the 19th century, or to fly for the first time in the 20th century. What component or aspect do you geek out about most with E-bikes? I believe proportional assistance with a torque sensor is what makes ebikes sophisticated and modern, and so I would say it is what I am most interested in. Each manufacturer has a slightly different idea about what is important about their bike – range, torque, smoothness, simplicity – and this comes out in the way they tune the pedal assistance on their bikes. I feel really lucky to have the opportunity to learn a lot about many different bikes through trying them, talking to their designers, and giving feedback. 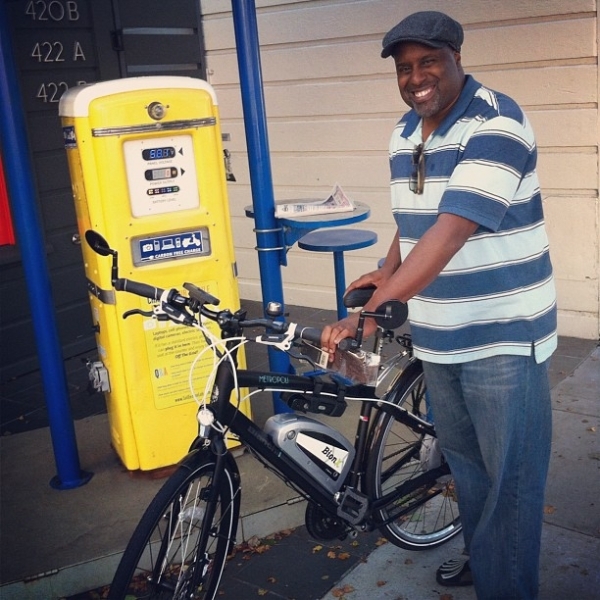 Do you find most E-bike riders were former cyclists, from another riding demographic, or fresh faces? It’s hard to say. We have a really diverse customer base. I would probably say 20% of our customers are regular bike commuters before they stop into the shop, and the rest really enjoyed riding but did it mainly for recreation. Why don’t we see more electric bicyclists on the road? That’s a complicated question. I think there are two problems, both interconnected, that have hampered adoption of ebikes in the US. Firstly, for a majority of people (and even bike shops) bikes haven’t been about transportation. And I think that because of that, ebike importers and manufacturers in the U.S. have treated the sector as a leisure product, and so they have been deathly afraid of bringing product to market that was in a higher price bracket. As the old adage goes, you get what you pay for, and so what the U.S. market got was a lot of fairly uninspiring, unreliable ebikes that consumers and bike shops were not that excited about. I think the fact that biking as transportation is now ascendent means that high quality ebikes are going to be adopted at an ever faster clip. Have you noticed any E-riding trends across different countries, regions or cultures? There are two main trends as I see it: there are ebikes that have reliability designed into the bike so as to minimize repair requirements and thus cost, and then there are ebikes that are designed to be inexpensive and fixable, but require much more repair work. The first type of ebike is the European variety, and makes sense in a place with high labor costs. The second is the Chinese variety, and makes sense for a place where there is cheaper labor and a broad and deep market in ebike repair. The worst case scenario has been in the U.S. where the labor is not cheap, the repair shop infrastructure is not in place, but the ebikes are often transplants from China where reliability is not the primary concern. I’ve noticed a bias from the cycling community toward E-bikes. What would you say to the haters out there aka what would your pitch be to persuade cyclists to give it a chance? The electric bike is a revolutionary form of transportation. It’s hard to argue with technology that the utility of an automobile but the footprint and reliability near that of a bicycle. What are the biggest advantages to an electrical bike over buying a scooter or moped? No license, no insurance, no gas. You can park an ebike anywhere; bring it into your office. It’s safer, you get exercise. Also I think it is much more fun. There’s at least two community rides a month with Critical Mass and Bike Party, yet I rarely saw electrical bikes. Why is this? Do E-riders identify with the cycling community, with another community, or a community entirely their own? I don’t think e-riders identify as much with the cycling community off the bat. It seems that for many of our customers they love riding because it is enjoyable and convenient. I don’t think our customers get into riding an ebike to be part of cycling culture per se. The first impulse is to get to and from work for the most part; later they end up joining the bike coalition and getting involved in the cycling community. Your shop is in one of the ultimate hip cities, San Francisco. How are you going to tap into the city’s hipness? Our shop is not what people expect when they hear electric bike. We’ve made conscious attempt to put our bikes in a setting that speaks to quality and substance: lots of wood, nice lighting, other great products. You put electric bikes in the right context and everyone is interested, young and old, hip and square. The tagline for your shop is, “An optimistic bike shop.” I don’t quite understand this, can you explain? Our tagline is a statement for us as much as it is a motto. It’s about the attitude we are bringing to this enterprise, as much as it is about the optimistic future that is possible as electric bikes catch on. What is the biggest downfall of an E-bike? The price is the biggest sticking point. On the flip side though, a higher priced product also elicits more respect and care from customers, which is in the end how products should be treated. We’re making headway with making our quality bikes accessible through the no interest financing programs we have at our shop. What is a scarce E-bike fact that I could impress another E-rider by dropping? Electric bikes are the most efficient mode of transport besides a bicycle – even beating out a fully loaded bus. I volunteered at the Bike Kitchen in San Francisco for years, and believe in empowering riders with the skills to care for their own bikes. What are the most common repairs to be made on E-bikes? This depends on what sort of electric bike you have. A high quality electric bike will require that you maintain the bicycle as you would any bike. You shouldn’t have to work on the electronics. So the main things to take care of are the brakes and replacing the chain every 1000 miles or so. On lower quality electric bikes you may run into electrical problems and you will probably run into battery problems, and there is often not a good way that a casual cyclist will be able to fix those problems. Do you need special tools in addition to bicycle tools to fix these? Are there any movements that you know of trying to empower ebike riders to be able to repair their own bicycles? Not that I am aware of. We are definitely in the business of educating our customers to be able to diagnose and make repairs on their ebikes. We’ve seen police officers on mountain bikes and segways, when will we see them on an E-bike? I think we will start seeing some ebike mounties (police) in the near future. Do you have any questions for Brett? Please leave them in the comments section below. Interesting report, but I couldn’t help but notice the recurring theme of a high price. A report should be done on the shop where I bought my ebike in Chicago, https://www.chicagoelectricbicycles.com/. They are also a small shop in Chicago’s Bucktown neighborhood. They use frames, batteries and motors all made here in th U.S. to assemble an ebike made by the shop in Chicago. The price? Their top of the line mountain ebike is $1900. I’m guessing that is at least a $1,000 less than any euro ebike. And the quality is outstanding. Good idea Phil. I will look into interviewing the owner of Chicago Electric Bicycles. I have built & rebuilt my semi-recumbent e-bike, and I am very pleased with the battery packs I bought from Chicago Electric Bicycles. As tothe problem of the “high” price for a good reliable e-bike: I used to have horses & play polo. That was expensive. By comparison I get what I want in an e-bike at a much lower price (Don’t even think about the cost of maintaining a horse!) –and– the e-bike is so much fun to ride that sometimes I feel disloyal to the memory of my horses; but then I think to myself: if I could bring the horses back to spend some time with me I would want them to have the fun of riding a good e-bike. When will we see the Prodeco article? When you look at price their bikes are another 30 or 40% less than the $1900 he quotes. Most reviews I have seen on the Prodeco models like the quality and performance. The 2 year end to end warranty and lifetime on the frame looks good too. A small point: Lani repeatedly says cyclists “have a bias towards ebikes” when she means “have a bias against ebikes.” Only half of biases are negative. PULLING A CHILD BEHIND BEHIND A BIKE IS SUBMITTING THEM TO ROAD/HEALTH HAZARDS ! Even with fenders etc… i saw one video on you tube were the kid got a eye full of road kill. PLEASE ? Use a full size wind screen. YES its a lot of wind drag How ever its a DRAG having one eye or worse. i only typed BEHIND ONCE ! Damn Censors !